If you were ever going to catch Sting in concert, Thursday night was the time to do it. Not pushing any new projects requiring symphony orchestras or a troupe of lute players, the musician's latest UAE jaunt was a greatest-hits affair celebrating a career that has spanned 25 years. Sting kept true to the tour's title, Back to Bass, as he took to the stage with a five-piece band and nothing more than a simple black curtain as the backdrop. The lack of audio-visual components or any whizz-bang effects was a risky move, as Sting is not the most talkative person on stage, but with a fast-moving 20-song set, the crowd had plenty to sing along to. The opener 'If I Ever Lose My Faith in You' established that Sting's voice only gets better with age. The added huskiness gave plenty of the tracks, especially The Police material, an extra emotional resonance not found on the album versions. 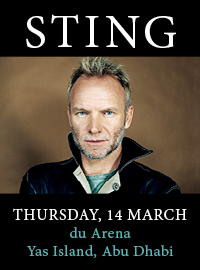 Sting was up for it, continuously shouting "yalla" to the band as they cranked out the hits with barely a few seconds' break in between. The follow-ups - the sprightliness of 'Every Little Thing She Does is Magic' and the subtle devastation of 'Englishman in New York' - had the crowd well and truly warmed up. The mandolin-led 'All This Time' - about the death of Sting's father - was a fine example of how the 61-year-old often uses sun-kissed melodies to disguise painful subject matter. 'Demolition Man' was a bluesy romp, with Sting spider-walking the stage with his weathered bass. Between songs, banter was kept to a few wry remarks. After confirming the crowd was having a good time, Sting drolly followed it up by saying: "Well, this is a song about death," as the band gently rolled into the elegiac 'I Hung My Head'. The luscious 'Fields of Gold' was introduced as "a song about my house in England. Well, it's a castle, really." As well as the hits, the set-list allowed for some indulgences. Despite the crowd interaction, 'Heavy Cloud No Rain' and 'Wrapped Around Your Finger' were snooze-inducing, with the audience wisely choosing the moments for toilet breaks. Fortunately, on both occasions, Sting resuscitated the set with The Police classics 'Message in a Bottle' and 'De Do Do Do, De Da Da Da' respectively. All the band members had a chance to shine, with the guitarist and Sting's long-time songwriting partner Dominic Miller doing a wonderful job in the delicate 'Shape of My Heart'. The thunderous performances by the violinist Peter Tickell and the backing vocalist Joe Lawry overshadowed Sting in the dramatic 'Hounds of Winter'. And to wrap it up, the band gelled together in an epic eight-minute rendition of the set closer 'Roxanne'. The added length allowed the group to indulge in some jazz and blues jams. The three encores showcased the slinky 'Walking on the Moon' and 'Desert Rose', although the latter's grandeur was cheapened somewhat by a pair of belly dancers flanking Sting. While 'Every Breath You Take' would have been a great way to finish, Sting elected to close the two hour show with the delicate 'Fragile'. Written in 1987, the track remains as affecting as ever and was the precursor for a 25-year period full of quality songwriting.